Lots of germination; lots of rain. I wrote some time ago about starting native perennials in winter sowing containers, and thought now would be a good time for an update. Given our especially long winter, the plants in the containers are still pretty small. The good news is, germination occurred in almost all of the 28 containers. The two that have not germinated yet — and I do not expect them to — got pretty water-logged and the seeds may have rotted. 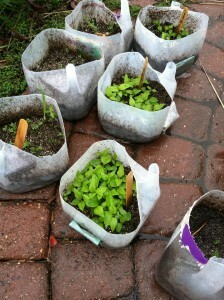 Because of the long winter, I did not end up following the usual winter sowing procedure. Normally, winter-sowers will put their plants out sometime during the winter and leave them there until it starts to warm up. Gradually, they will open the containers up, closing them at night to keep the plants warm. Minnesota springs are not usually gradual and this one was light-speed. On May 2, we had about 10 inches of snow on my garden and a temperature around 28. On May 14, the temperature flirted with 95. (Are we crazy to live in this climate? Very likely.) In any case, once it started to warm up, I just took the covers off of the winter sowing containers and called it a day. Of course, since then, it has been cooler, grayer and pretty wet. I’ll let the plants get up to size and then, over time, transplant them out to the meadow where they will add color to the grasses and other plants I purchased from Prairie Moon Nursery. My experiences with winter sowing have always been mixed. It does work — no question about it — but it does not work as well as starting plants under lights. It’s great for a situation like this one: I want a lot of plants and I want them cheaply. What’s been your experience with winter sowing?